Web of Science: What plants in Iceland are poisonous? What plants in Iceland are poisonous? It is not possible to give an exhaustive list of poisonous garden plants and weeds but here are a few examples. English ivy (Hedera helix) is grown both indoors and outside. Its berries are poisonous. They cause stomach ache and can destroy red blood cells. But that may not matter much in Iceland as I do not know how common it is here that English ivy produces berries. There is poison in the seeds (i.e. beans) of the golden chain (Laburnum, pictured right) with similar physiological effects as nicotine. In foreign countries, children have died after eating the seeds. Then there is the conifer, yew (Taxus), of which a few specimens can be found here in Iceland. The yew produces red berries which can be quite toxic. One poisonous garden plant genus is Aconitum, which includes monkswood or aconitum napellus. It contains aconitine that causes a burning sensation in the mouth and throat followed later by severe abdominal pains, numbness and irregular heart beats. Monkswood can be fatal. All parts of the plant are poisonous, particularly the parts below the surface of the soil. One group of active plant chemicals is the cardiac glycocides, that affect mammal heart muscles and many of which can be fatal in small doses. Some are important drugs, used to strengthen weak heart beats, e.g. after a heart attack. The most important heart drug is extracted from the purple foxglove (Digitalis purpurea), which is grown as a garden plant in Iceland. The lily of the valley (Convallaria majus), also contains cardiac glycocides. Some have been used for making drugs. The toxic effects of furanocoumarins are enhanced by sunlight. These compounds can induce a kind of allergic reaction. They mostly occur in plants of the apiaceae genus and some can cause serious blistering. Giant hogweed (Heracleum-species) is a very large plant and is grown in a number of places in Iceland. Exposure to sunlight after touching a giant hogweed causes inflamation of the skin, followed by painful blistering. On healing, a discolouration remains on the skin that can remain clearly visible for many years. Al least some types of dames rocket or windflower (anemone) contain poison that causes inflammation of mucous membranes and sometimes blisters on the skin. The marsh marigold (Caltha palustris) belongs to the same family (buttercup) and is often categorised as poisonous. The active agent is related to the poison in dames rocket. There are two types of weed that can be included. Groundsel (Senecio vulgaris) contains a chemical that can cause serious liver damage and one hears regularly about cases abroad where cattle have died from this poison. Coltsfoot (Tussilago farfara, pictured left) has been used by herbalists, but there is a poison that can cause liver damage in rats in the receptacle/sepal. The Alaska lupin (Lupinus nootkatensis) produces a poison that can cause paralysis in sheep. The sheep can graze the lupin as long as they only take a little at a time and have other vegetation in their diet. It has been established abroad that the toxic effects of lupin can manifest themselves as genetic faults in calves and lambs, even when no symptoms were observed in the mothers of the affected offspring. Rhubarb and garden sorrel(Rumex acetosa, to give it its proper name, but often called sour dock by children who love its sharp tang) are closely related and both contain quite high concentrations of oxalic acid - which gives them their distinctive taste. The level of oxalic acid is so high in rhubarb that it can adversely affect renal functions and one should not eat too much of it. Various species in the Icelandic flora produce chemicals that can have toxic effects. Usually the poison is in such small concentrations that it has a negligible effect on large mammals, including man. People would not normally say that such plants were poisonous. There are at least two species in the Icelandic flora that can produce prussic acid, white clover (Trifolium repens) and marsh arrow grass (Triglochin palustris). Prussic acid is highly toxic, but neither of these plants is dangerous. Foreign research has shown that sheep appear not to discern the prussic acid in white clover, whereas snails avoid the clover and choose plants that are free of prussic acid. Gentiana contain significant amounts of chemicals that can affect animals, both alcaloids and glucosides. Gentian (Gentiana campestris) is a traditional Icelandic herbal remedy that was used for a wide range of complaints. I am not aware of any research having been done on the chemistry of the Icelandic plants but it is worth noting that drugs for treating anorexia and digestive disorders are made using extracts from the roots of related foreign species (Gentiana lutea) and other gentiana are used as flavour additives in liqueurs. A few Icelandic species can have toxic effects if they are consumed in excess, but there are few examples of serious consequences. A good example is the buttercup (Ranunculus acris, pictured right) where the burning taste and inflammation are caused by glucosinolate compounds. These compounds can cause irritation and blistering, stomach pains and diahorrea. Cattle avoid buttercups, which benefit from other species being grazed, and tend to spread in grazing land. Two of the largest families in Icelandic flora, the grass family and the sedge family, generally do not contain toxic compounds. It should be noted that Lyme-grass sometimes carries highly toxic fungi. It forms resting spores in the seed ear and infected plants produce long, black, hard sclerotia instead of seeds. They are called ergot bodies and contain hallucinogenics, related to the active agent in LSD. They also cause vomiting and can be fatal in large doses. There are many examples from the Middle Ages of whole villages being affected by these toxic effects, as the same fungi is found in other kinds of grain, such as corn. And finally there are two monocotyledonous plants worthy of mention. Herb-Paris (Paris quadrifolia) is a rare, protected and unique species. There is a poisonous compound in its berries and stem, and a related Chinese species has been used in the treatmnet of cancer. Scotch false asphodel (Tofieldia pusilla) is another unusual plant. It is very bitter to taste and causes numbness and burning on the lips and in the mouth and considerable irritation in the mucous membrane. Sheep spit out this plant if they inadvertently graze it, and one can often see broken plants discarded in pastures. 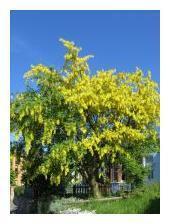 Golden chain: Laburnum. Wikipedia: The Free Encyclopedia. Photograph by Andrew Dunn. 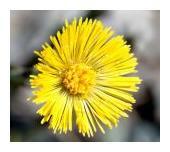 Coltsfoot: Coltsfoot. Wikipedia: The Free Encyclopedia. Photograph by André Karwath. Buttercup: Brennisóley. Wikipedia, frjálsa alfræðiorðabókin. Photograph by Kurt Stueber. Þóra Ellen Þórhallsdóttir. „What plants in Iceland are poisonous?“. The Icelandic Web of Science 29.12.2005. http://why.is/svar.php?id=5522. (Skoðað 21.4.2019).